We get asked all the time what does "De Stijl" mean. "De Stijl" pronounced (De Steil) is a Dutch word that literally translates to English as "The Style". "De Stijl is an artistic movement founded in 1917 in the Dutch city of Leiden that consisted of artists, designers, painters, sculptors, and architects. The movement was a reaction to the Modern Baroque movement of Dutch expressionist architecture. With subtle Bauhaus influence, "De Stijl" was largely focused on abstraction universality as well as functionality and block shaped imagery. The movements influence on architecture was considerable and lasted long after its inception. Visual composition of "De Stijl" consisted of horizontal and vertical lines in black, white, and primary colors. Theo van Doesburg, Piet Mondrian, and Ludwig Mies van der Rohe were among the most important proponents of its ideas and were at the forefront of the modernist "De Stijl" movement. In 1923, Gerrit Rietveld the artist and architect designed the Rietveld Schroder House pictured below, the only structure to be completely designed and built according to De Stijl principals. In 2017 the "De Stijl movement celebrated it's 100th anniversary since it's founding in 1917. We are very passionate about home, design, art, music, style, and with "De Stijl's" influence on structure and modernism in architecture we felt it was very fitting name. 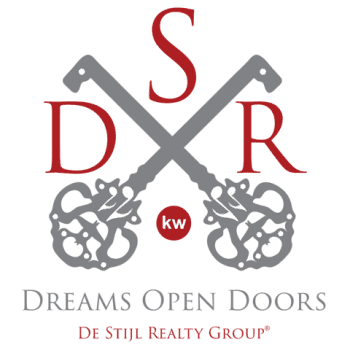 DSR Realty group was founded in 2017 to work closely with our clients, discovering their personal passion (lifestyle), to paint outside the lines, to create and design a different box, to follow the music of life and help strike the perfect balance of home, family, community, functionality, and style (your style).